Creativity meeting Reality: Two Cigarettes(Horned) Rhyno!!! Hey guys... Well this is my buddy Guillome!!! 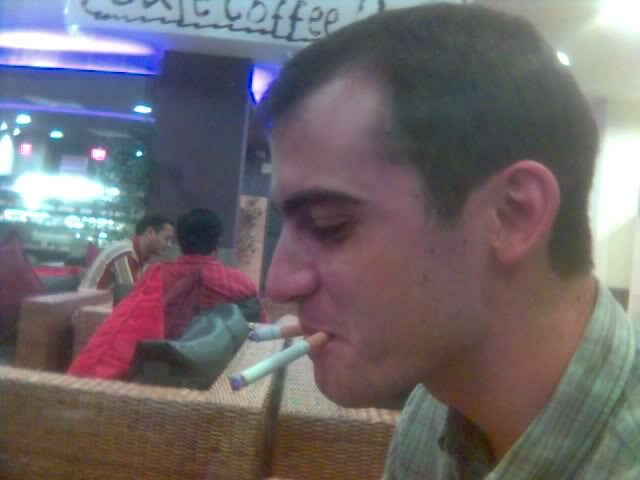 And does he look crazy with two cigarettes!! he he.. Anyways today was a great day.. Firstly I got up at 7 30 in the morning which is something out of the normal nowadays(I land up getting up only by 12 on most days).. And i attended class!! Then we had the freshers party for the juniors this afternoon...Was pretty good.. Then went over to Elise's place for diner... Well was a typical French menu... It was a lil difficult with my taste buds too.. As french people prefer their food without too many spices...So being Indian.. I had to load my plate with Pepper and Salt to be able to finish the dish.. But yes the dish was different and nice.. Then we sat and talked and talked for like hours.... Was great fun!!! haha ! just ask them to prepare a "bouillabaisse" with a strong "aïoli" and a very hot "rouille"! He he... So nice to call me a Rhyno, at least there's a capital letter!